1 Steve: Crikey! The Peruvian mountain anacondas must have escaped! 2 Steve: It's okay though. You'll find them easy enough. As long as there's no highlands around for them to hide in. 4 Quarantine Officer: This is Scotland. Glasgow isn't quite in the actual Scottish Highlands, but it's close enough for some giant snakes. Go find a map of Scotland. Wait a minute, what am I saying? This is the Internet! Here's one. :-) This map is copyright-free, since it is produced by the C.I.A., and is available in full from the astonishingly brilliant Perry-Castañeda Library Map Collection at the University of Texas. Okay, had a good look? Scotland is at the north end of the United Kingdom. The Scottish Highlands cover the entire rugged looking region north of Glasgow. 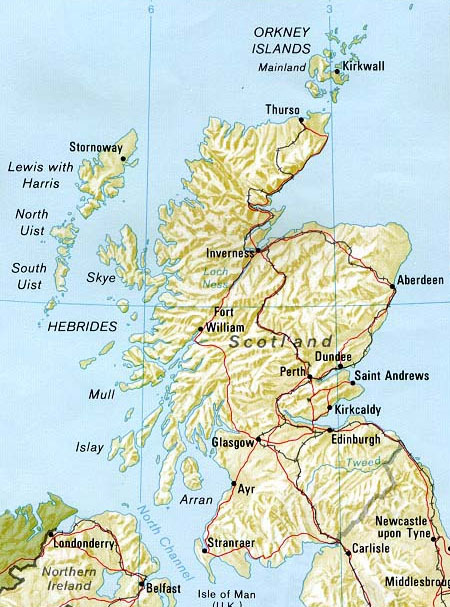 Note the intriguing feature of the geography, in that Inverness and Fort William are connected by an obvious straight line cutting across the peninsula. Along this line lies Loch Ness, the second largest but probably the most famous lake in Scotland. Loch Ness itself is highly elongated in shape, running directly along the line previously mentioned. This line is actually a long series of valleys, known as the Great Glen, cutting right across Scotland from one coast to the other, and bisecting the craggy highlands that rise on either side. All in all, it's a rather striking geological feature. The Great Glen in fact, as some of you have no doubt realised by now, marks the location of a major fault in the Earth's crust. The land north-west of the fault has slipped northwards relative to the land south-east of the fault. And it doesn't stop in Scotland. The fault runs right through Ireland as well, straight through the bay near Londonderry that you can see on this map, and out the western side of that island. There are mountains in Scotland. Where else do we see mountains? There's a whole big chain of them running up the back of Norway. In fact, with a tiny bit of imagination, you can picture the chain of mountains running along Scandinavia as continuing across the North Sea into Scotland. It makes a nice arc. 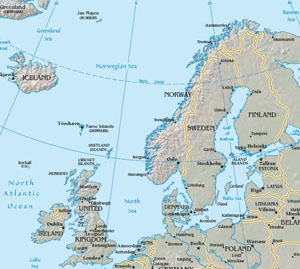 In fact, the mountains of Scotland and Scandinavia are part of the same mountain range. This immense range of mountains was produced during an event known as the Caledonian orogeny. Caledonia is the ancient Roman name for Scotland, and orogeny is a technical term combining the Greek oros, meaning mountain, and genus, meaning generation. The generation of the mountains of Caledonia and Scandinavia occurred roughly 400 million years ago, at which time the continents of the Earth were in very different locations to where they are now. They were so different, that we can't even sensibly refer to them with our familiar names. At that time, there was an ocean known as the Iapetus Ocean. Don't go looking for it on a modern map, because it doesn't exist any more. On one side of the Iapetus Ocean was the continent of Laurentia. On the other side were two landmasses known as Baltica and Avalonia. The movements of plate tectonics slowly but inevitably caused the shrinkage of the Iapetus Ocean, with Laurentia moving closer to Baltica and Avalonia, until the fateful period of history when these continents collided. In exactly the same way as the collision of India with Asia has more recently produced the crumpling of the Earth's crust that we know as the Himalaya Mountains, this titanic altercation gave rise to a great range of mountains. The now combined landmasses of Laurentia, Baltica, and Avalonia eventually formed part of the single supercontinent of Pangaea, which existed around 250 million years ago. So this collision and mountain building was by no means a sudden thing; it took many millions of years to occur. The Appalachian Mountains. That enormous range of mountains running diagonally across the eastern USA. You can mentally extend them north-east, up the peninsula of Maine and New Brunswick, across the Gulf of St Lawrence, across Newfoundland, and then... you are forced to a stop by the Atlantic Ocean. Only imagine the ocean isn't there. Slide Newfoundland across to nestle next to Ireland. Then the Appalachian Mountains can continue right through the Scottish Highlands and on into Norway. We were looking for Laurentia. We've found it. Laurentia is North America. The Appalachians are the same mountain range as the Scottish Highlands and the mountains of Scandinavia. How do we know this? Because we can see the evidence in the rocks. If you examine the rocks and fossils of the Appalachians, you can see that these mountains were also generated around 400 million years ago, in an event known as the Acadian orogeny. So at this time, the Iapetus Ocean closed up, Laurentia, Baltica, and Avalonia collided, and produced an enormous range of mountains. Later, the movements of the plates of Earth's crust separated Laurentia from Baltica and Avalonia again, sundering the mountain chain in the middle, and producing the new (and still expanding) Atlantic Ocean between them. 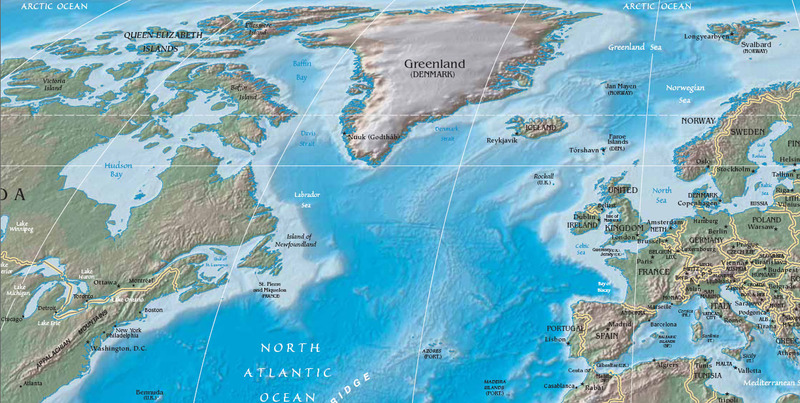 But let's have a closer look at the area where these great landmasses were ripped apart. On the American side we have the island of Newfoundland. Here's what it looks like from space. Remind you of anything? Have another look at Scotland (at the top of this annotation). Remember that Great Glen fault line running right across the country, from north-east to south-west? There's also a major dislocation running across Newfoundland, from north-east to south-west. It's so big, it almost separates the island into two pieces. Only a tiny isthmus remains to connect the bulk of the island to the irregular blobby peninsula dangling off the south-east corner. Note also that many of the obvious geographical features run north-east to south-west, just like the Appalachian Mountains, and the arc of Scotland to Scandinavia. Now here's the really interesting bit. If you go to Newfoundland and have a look at the rocks and the fossils contained in them, you find that they confirm the idea that the island is really an extension of the Appalachian Mountains. The rocks and the ages of the fossils all match. Except for that almost-detached peninsula on the south-east of the island. There, the rocks are strangely very different. What's more, the fossils in the rocks are completely different to the fossils found on the rest of the island. The fossils of the time when these rocks and mountains were laid down include a lot of graptolites and trilobites. These are great fossils for palaeontologists to find in rock beds, because they were very prolific across the world at the time, and because they varied with geographical distribution. The graptolites and trilobites found in one part of the world were noticeably different from those found in another part of the world. In particular, the fossils found on the Baltica/Avalonia side of the closing Iapetus ocean were very different from those on the Laurentia side. In other words, the graptolites found now in the Scottish Highlands are different to the ones found in the Appalachians, and to the ones found in Newfoundland. Except for that dangling peninsula. The graptolites there are an exact match to the ones found in present-day Scotland. What's more, the rocks of the peninsula themselves are of a type not found elsewhere on Newfoundland, or in the Appalachians, but are precisely the same as the rocks found in Scotland. Well, not all of Scotland. The rocks and fossils found in the highlands west of the Great Glen are very peculiar. They don't look like anything seen anywhere else in Scotland. What they look like, in fact, is rocks and fossils from the western side of Newfoundland. When Laurentia collided with Baltica and Avalonia, the Laurentian side ended up with a characteristic set of rocks and fossils, and the Baltica/Avalonia side gained a different set of rocks and fossils. Hundreds of millions of years later, when the Atlantic Ocean ripped the melded continents apart once more, it didn't use the same boundary to separate them. Laurentia left behind a part of itself. The north-western part of Scotland used to be part of what is now North America. 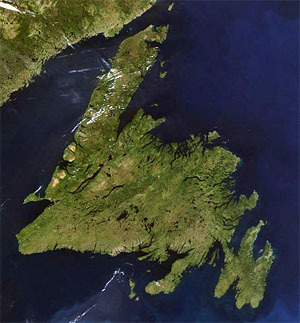 And the south-eastern tip of Newfoundland used to be part of what is now Europe. Anyone who knows Canadian geography reasonably well will know that that part of Newfoundland is called the Avalon Peninsula. 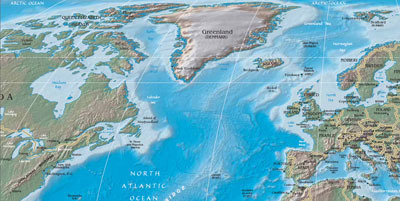 It was the evidence from this part of Newfoundland that allowed geologists to piece together the history of the North Atlantic and the continents on either side, and this is why they decided to call the proto-continent that would later become the bulk of Europe: Avalonia. 2019-03-23 Rerun commentary: I must admit my own knowledge of Canadian geography before writing this annotation wasn't quite up to scratch. I could tell you roughly where Newfoundland was, but didn't really know much beyond that and a basic knowledge of the other provinces and a handful of major cities. Usually, unless you're visiting, there's not really much need to know geography of foreign places. It's nice to know, but not knowing isn't really going to bother most people. Geographical knowledge is highly concentrated in the areas where you live and work. You know names of streets, and intersections, and where certain businesses are located, and even finer details like where you can find mailboxes and bus stops and a bench to sit on. And expanding your circle, you probably know the names of all the cities and towns within a few hours drive, and you have a general idea of places in your own country further afield. But think about a country on the other side of the world and you may be lucky to be able to name the capital city, let alone any of the political subdivisions or second-tier cities and towns, or identify any of them on a map. In the future, people living on Mars are going to know all the craters and valleys and stuff around them, but won't be able to locate North America on a map of Earth.